Thanks to generous community support, Rotary Flames House – Alberta’s first pediatric hospice - has become a place of solace and comfort for families of children with progressive, life-threatening illness. Here, they can find the care they need during their child’s end-of-life journey and well before that point through much-needed respite care. 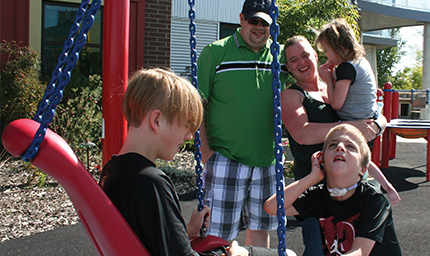 Rotary Flames House offers rest and renewal for families dealing with the demands of caring for children with medically complex and incurable illness. At the same time, the team customizes programming for these special youngsters so they can make the most of every moment of their childhoods. 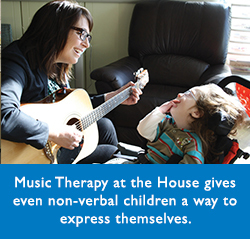 is getting to play with instruments during music therapy. Meanwhile Parker enjoys the big fish tank and swinging in the special hanging chairs in the House. Attending special events at Christmas and Halloween, as well as summer barbecues designed for families like theirs has made a difference, too. “It means a lot to connect with other families who are walking a similar journey with their children. We totally understand each other and no one gets too fussed when I have to stop a conversation to hook up my child’s feeding tube,” says Melinda. Join our e-mail list to get regular updates!